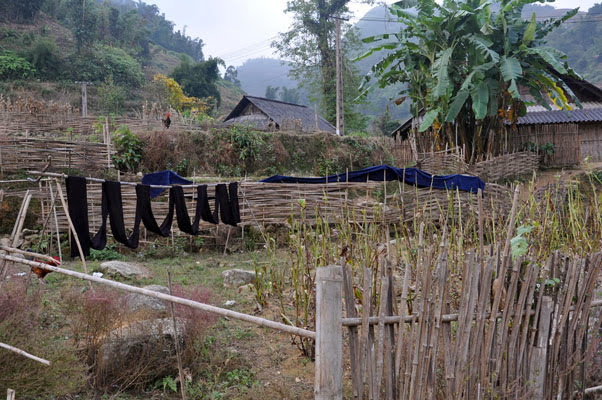 Hemp production and indigo dyeing are still practised by the Black Hmong around Sapa in North Vietnam, as well as the beautiful embroidery to embellish their outfits. 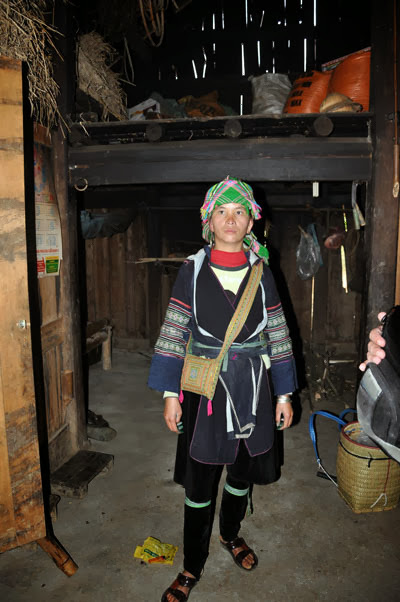 above image is of one of the Hmong women in her home in the mountains around Sapa. Indigo dye is an organic compound with a distinctive blue color. Historically, indigo was a natural dye extracted from plants, and this process was important economically because blue dyes were once rare. 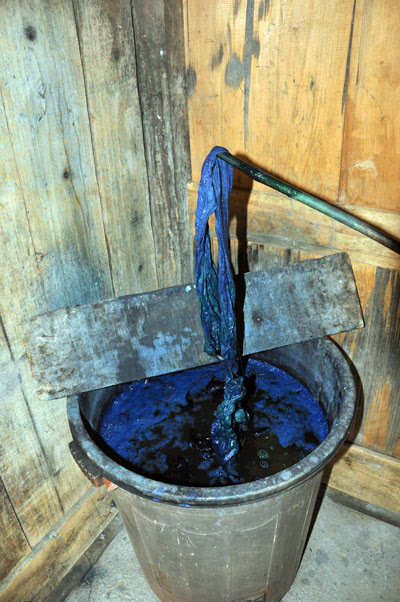 Nearly all indigo dye produced today — several thousand tons each year — is synthetic. It is the blue of blue jeans. But in North Vietnam the Hmong women still do all this manually! 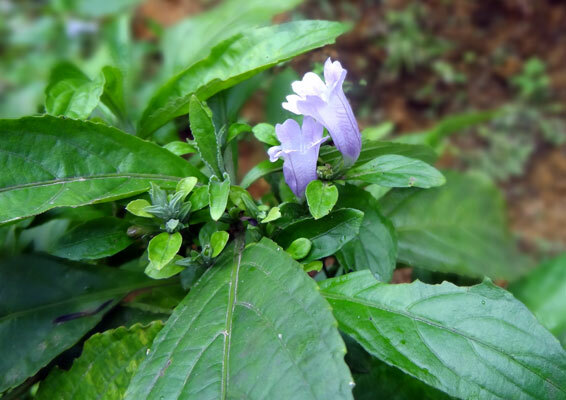 The indigo plants are cultivated in neat plots on the hillsides near the houses. 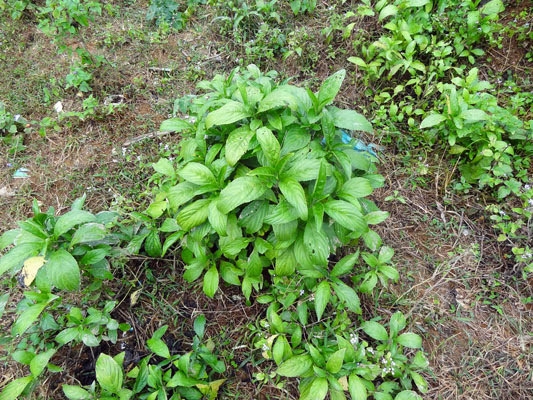 The plant grows to about 60 cm high and can yield 2 crops each year. 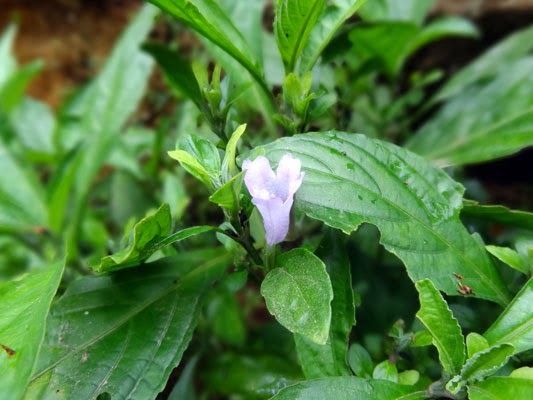 The dye is contained in the leaves which when allowed to ferment and then oxidise produce a blue powder that is insoluble in water. This can be stored as a paste or powder. 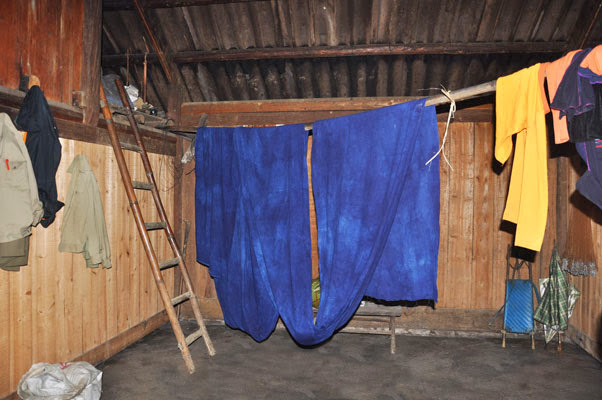 the above images were taken in the home of the above Hmong woman where she does all her own dyeing and weaving. 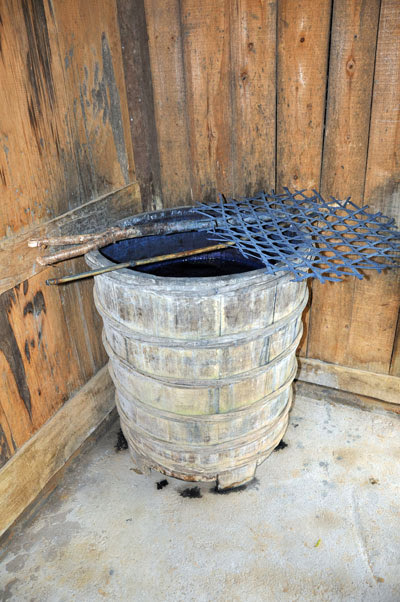 There are various ways of preparing the Indigo vat with substances that make the Indigo soluble. The urine of children, particularly boys is a common additive as well as lye, lime and rice wine. When the dye bath is bubbling strongly it is ready to use. The fabric is immersed in the dye vat and worked for about half an hour then hung up to oxidise into the distinct blue colour. 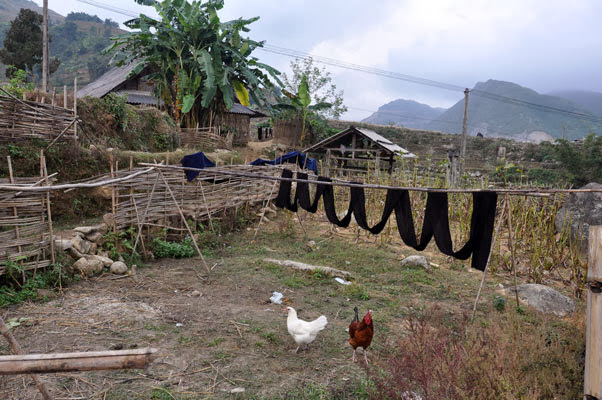 Subsequent dippings and oxidation's will darken the colour and the black of the Hmong fabrics is achieved by repeating the process twice a day, each day for a month. above images of the dyed fabric inside the home and outside to be sun dried. above image is the hand of one of the Hmong women, all of them have these 'blue hands' permanently stained from the indigo! The highest quality hemp for weaving is grown on the better lands near the village where domestic animals are fed and leave their manure. The size of the hemp field and the quantity of hemp seed sown are decided by the woman's ability to weave and her need for new cloth. In general, the size of each family's hemp field is determined by the area required to sow about 2.5 kg of hemp seeds. When the sowing time comes, women spread a thick layer of manure across the tilled field, before broadcast sowing the hemp seeds and turning them into the soil. The seeds are planted close together like wheat. In this way, the hemp will grow tall, thin and straight, and the quality of the fiber is improved. In Vietnam, hemp plants are often interspersed within maize crops. The hemp seeds are sown after the maize crop has already grown to 10 - 20 cm tall. The crop cycle for fibre hemp is usually lasts about three to four months. The Hmong women know exactly when it is the time to harvest. If the hemp is harvested too early, the bark is not consistent and strong enough. If harvested too late, the bark is too thick and it is difficult to spin into yarn. The field is sown with hemp for two years at most before the soil is exhausted, and then the hemp crop is moved to another field. After the harvest, the leafy upper portions are removed, the stalks are bundled up according to size; tall, medium and short and then they are dried in the sun for three to five days. While in this area, we bought a couple of handbags, two wall hangings and some cushion covers, I will treasure them forever remembering the hands that made them, the hands that live in poverty but in such a rich culture. Stay tuned for further blog posts on the Sapa Region of North Vietnam. Indigo is probably my all time favourite colour. How lovely to know its origins. I adore the deep black fabric and how lovely it looks hanging there too. It's such a shame that the prices these people realise for their hard work and expertise is not a fair one. Surely ones who work such rich artistry should also feel the weight of some wealth in their pockets. 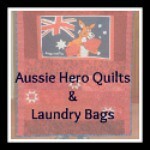 As for the natural vs synthetic dyes, I know which I would prefer in each and every way. These women (and the men too) work incredibly hard. They get up at about 4.00am, prepare the breakfast and, organise the children and then they start the long journey (by foot) into the town of Sapa .... about 2 hours away. This is where they can sell their wares, do their marketing or hopefully latch onto a couple of tourists as guides. They then walk back to their village (another two hours) and start the evening meal and do their weaving, dyeing etc. This goes on 7 days a week / 365 days a year. They have no knowledge of the written language but are excellent in conversing in English .... when we asked how did they learn to speak English so well, their reply was: We learn from the tourists! What dedicated work, Thanks for sharing this Leone.